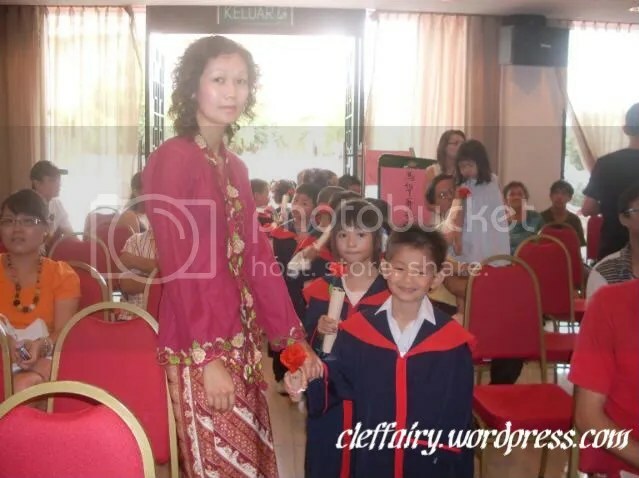 I was given an opportunity to attend a kindergarten graduation ceremony last Sunday that was held at Imperial Restaurant in Klang, Selangor Darul Ehsan. To be honest, yours truly is not a fan of noisy places or loud concert, as it never failed to gives her migraine and intense headache. If asked to choose between attending some noisy concert or watching a movie in the cinema and sleep like a log at home, I’ll definitely choose to stay at home and enjoy the peaceful moment. However, concerts that is for a good purpose and not purely for entertainment is always an exception. Once again, I’m given a chance to be a busybody that I am. 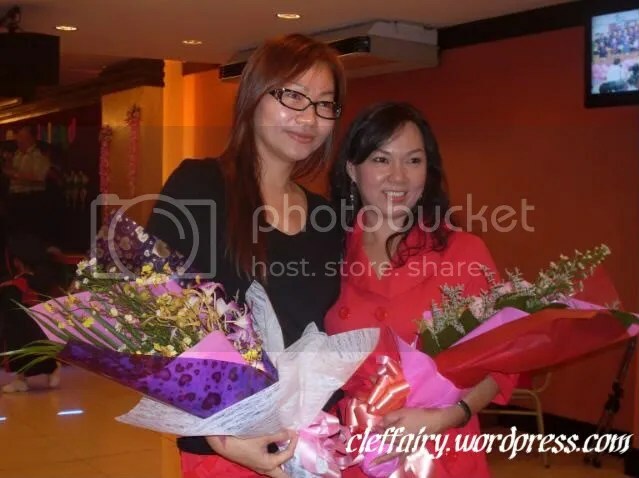 It was a happening event that brought happy and smiling faces in view. Proud parents and teachers alike can be seen throughout the whole event. Love and affection towards adorable and innocent children was in the air. Being able to do coverage for a kindergarten graduation concert like this one is definitely a good experience for me. 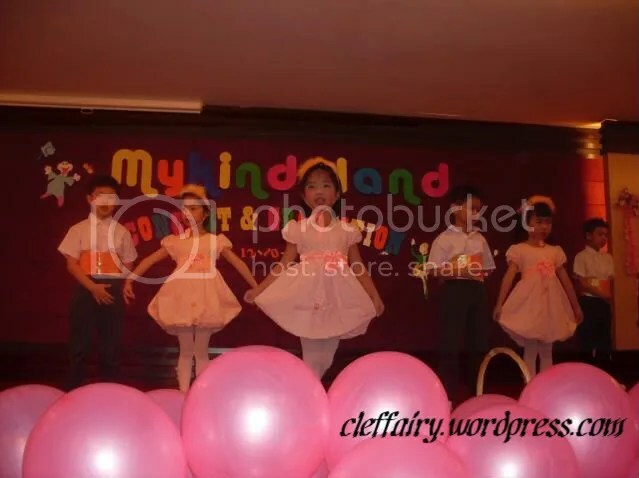 Adults who performed flawlessly on stage is indeed entertaining, however, concerts that is performed by young children as young as three years old not only amuse me to no end, but makes me proud of them for being courageous enough to go on stage and perform. Whether there’s flaws in their performance or not, credits should be given to them as they had made huge effort to coordinate themselves on stage. While most parents believe that the graduation ceremony is the day that they celebrate the milestone where their children will soon be in primary school and a great time to show off their offspring’s talent without having people snort at them for being snobbish, I believe, the real purpose of the graduation concert that is held yearly is not just about showing off their children’s budding talent. Psychologically, the real purpose of events like this is not only to celebrate a certain milestone hit by the children, but is to build confidence and self-esteem in the children at a tender age. Children, being young and innocent, tend to be shy, lack of confidence and easily scarred if they are not brought up with love and care when they are at a young age. Proper education and the way that they’re brought up will determine whether they will be a well rounded individuals who excel in whatever they do and see everything in a positive light when they grow up. So in other words, early education matters. If one wants to mold a child into having an outgoing and optimistic attitude in the future and the rest of the child’s life, they would have to start early, as early as when the child is still in nursery or kindergarten. The whole process of the concert and graduation ceremony itself is a learning process to the children as well as their teachers. During the training and preparation for the concert, children are taught the importance of communication and coordination. Along the way, they slowly gain self confidence and learn how to to work together with their peers. Teachers and educators too learn from the whole experience. Dealing with young children who are fussy and gets cranky easily is a gruesome task. It takes a hell lot of patience and kindness to train children to perform. Training children to perform on stage is not a bed of roses, as sometimes, it takes a lot of coaxing and persuasion to even make some of the children to perform on stage. Not all children are outgoing and outspoken. Some of them are easily intimidated, and it’s not easy to eliminate their shyness as well as stage fright. My respect goes to the teachers for making the event possible. As I observed the whole concert takes place, I can’t help but notice that there are a group of parents who expects too much from their young children. Instead of giving them unconditional encouragement and applaud them for their wonderful performance, some of them tend to comment and criticize their children’s performance on stage. Some parents even have the cheek to compare their child’s performance with their peers who performed better than them, instead of giving them a pat on the back for the efforts that has been made by their children. I came across a parent who chided her daughter for the ‘not so perfect’ performance after the concert, and I couldn’t help but feel awful for the child. I noticed how the girl’s happy face became crestfallen within seconds as she listened to her mother criticizing her in public. Constructive criticism is meant to improve someone’s effort on certain things, yes, that fact is undeniable. But is criticism on children’s effort toward something constructive? While my question is meant to be rhetoric, it’s important to note that young children are easily scarred and judging their effort may undermine their self confidence. I’m convinced that while parents should maintain to encourage their children to be competitive as it’s crucial to do so in our whirlwind education system, it is also important to remember that the process of growing up if full of trials and error. Not everything is meant to be perfect, especially the process of learning and growing up. Lowering expectation and easing up a little bit towards children’s achievements would make parenting a better experience. 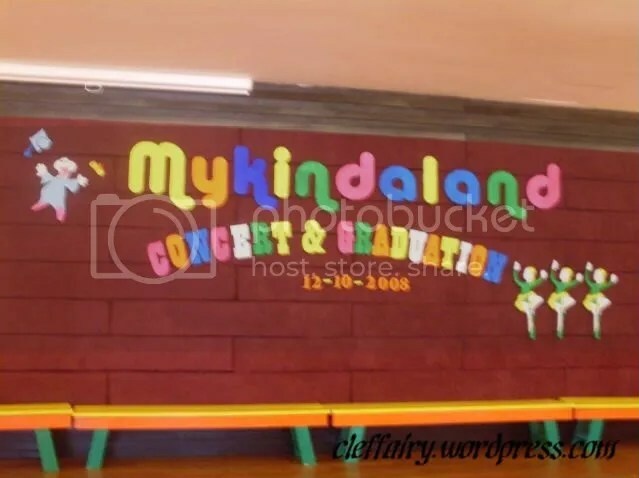 Despite of having teachers to deal with children who suddenly decided to have stage fright before the concert commence, everything went smoothly. The concert was a huge success, and I’d like to congratulate everyone who was involved in making the whole event possible. They did a great job indeed. A teacher putting make-up on her student. 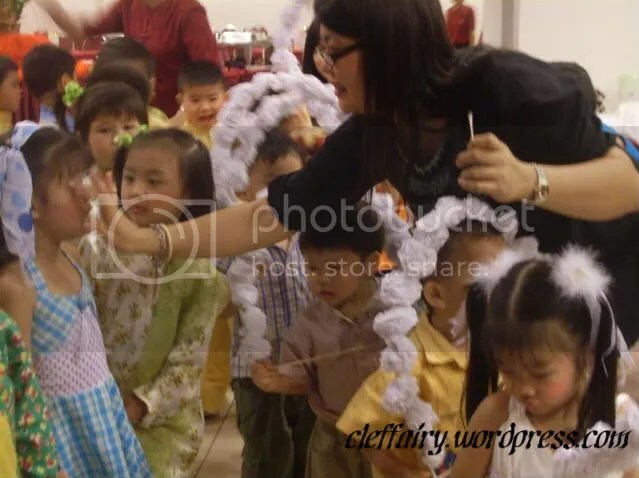 The picture above shows a teacher putting up make-up on her students. It’s quite a tedious task for the teacher, I must say, as there’s about 100 students who are involve in the concert and requires some makeover so that they will be more photogenic on stage. A few teachers were assigned to tend to the students who were lining up for make ups on their face. The make up was not only put on little girls face, mind you. They even put make-ups on little boys too for better effect on stage. 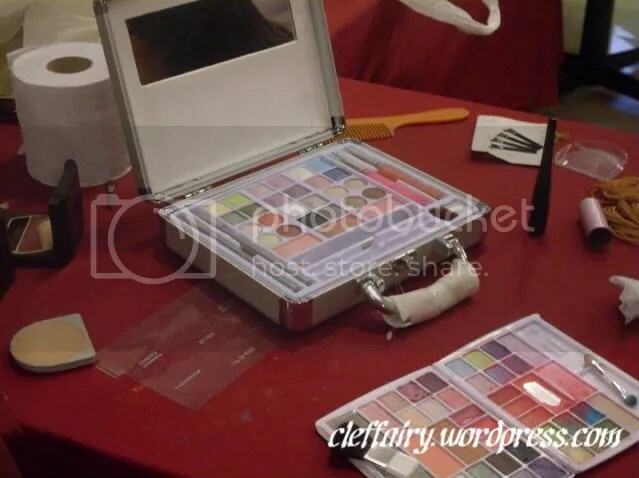 This is the make up kit used by the teachers to put colours on the children’s face. Seriously, I wonder if the make up is friendly on children’s skin. It’s common knowledge that children have more sensitive skin in comparison to adults. Using a wrong product may cause allergic reaction. I just hope none of those adorable children gets itchy reaction or rash on their skin after the concert. The scene above took place before the concert started. Some parents are getting anxious as they waited for the concert to commence. 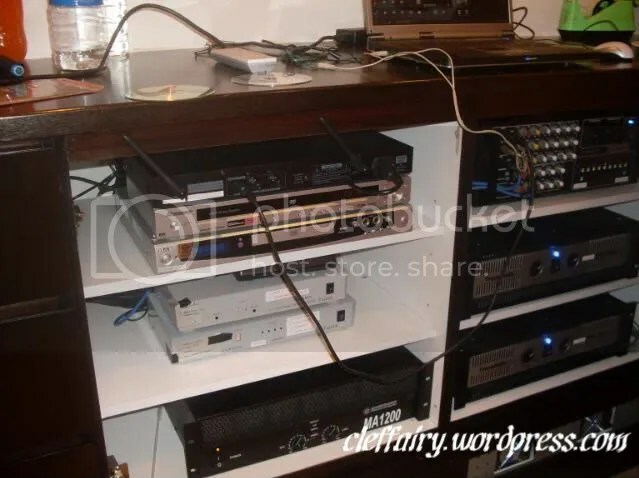 Ladies and gentlemen, presenting to you the shy technician who was in charge of being the deejay for a day. The man was in charge spinning songs for the concert. Above is the Imperial Restaurant sound system equipment. I’ve seen a lot of sound system during my time as a journalist as I did coverage for events. This one by far is the smallest one I’ve ever seen. I doubted the functionality of the equipment when I first saw it, and I was told by the cameraman who was in charge of making DVD for the concert that the sound system might not be sufficient enough to create a good music environment, but the technician in charge of the sound system made it work. I always admire people behind the scene of any event. They make things that’s seems impossible possible. Counting heads? Counting pom- poms? 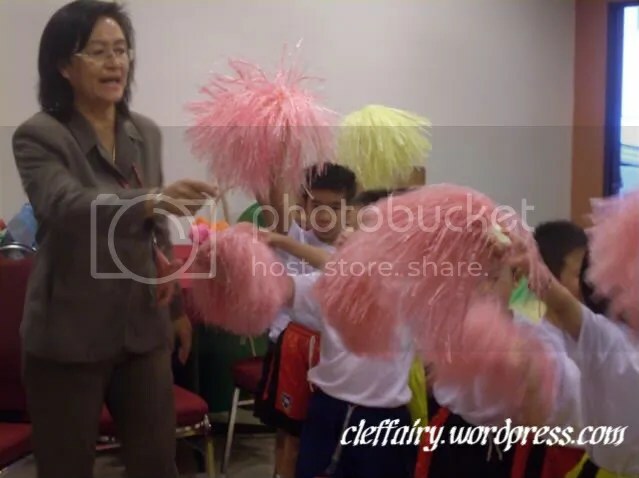 Nope, that’s the principal, Ms. Elaine Low, known to the students as Teacher Elaine, briefing the children and giving them last minutes reminders on their performance a few minutes before the concert started. The principal seems to be as jittery and nervous as the students themselves. Last minutes finishing touches by the teachers on the student’s make up. The teachers can’t resist doing so, I guess. They wanted to make sure that their students looks their very best during their performance. Finally, at 11am sharp, the concert was kicked off. The emcee took her place at the side of the stage and told everyone to stand up as Negaraku music was aired. The children sang the national anthem, but much to my surprise, none of the parents actually sang Negaraku. Frankly speaking, I was not sure how I felt at the moment. Was it supposed to be that way? I was prepared to sing the national anthem on the top of my lungs when the music was played, but I held my tongue because no adults present is singing. Some were even chatting among themselves when the song was aired. Have the adults lost sense of patriotism? I know that the event is children centred, but we’re talking about national anthem, aren’t we all supposed to sing along in events like this? Did I missed out something? When I was in kindergarten in England, even during events similar to this one, the parents would sing God Save The Queen along with the children. As I stood to respect the national anthem, I wonder if things worked differently in Malaysia when it concerns the singing of the national anthem during kindergarten’s events. Perhaps, things in Malaysia worked differently after all. Anyway, let’s keep the story short. The children sang national anthem as well as their kindergarten song, and much to my surprised, the principal was not called out to give her opening speech. I had expected that the principal to be honoured and give the opening speech. 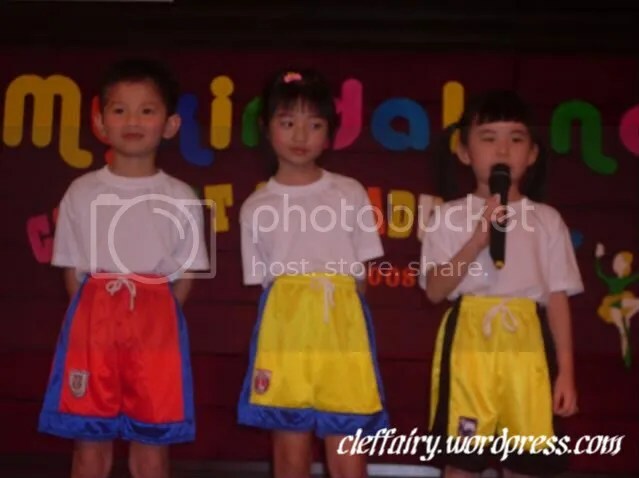 Instead, 3 children represented their fellow students and give the opening speech in 3 languages. First, it’s in national language, followed by English and Mandarin. I was amazed by their fluency as they recited their speech. I really wonder how long did they take to have the speech memorized, as none of them have paper in hand to refer to. 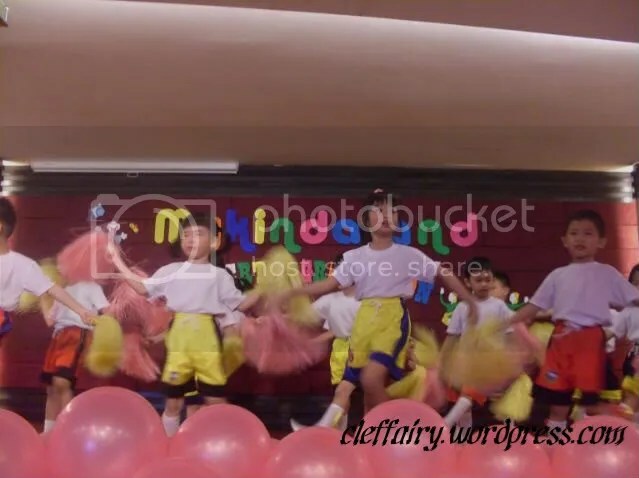 The performance finally started with excited and energetic children dancing to the song YMCA. A picture of Mykindaland students on stage, singing the song Edelweiss. All right, a little bit about Edelweiss. It’s not just a song from the Sound of Music, Edelweiss is actually a flower (Leontopodium alpinum), one of the best-known European mountain flower and belongs to the sunflower family (Asteraceae). 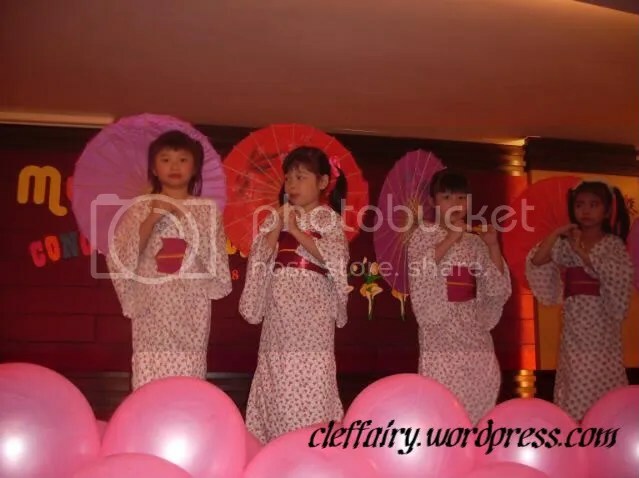 Next up, cute little girls in kimono performing a Japanese umbrella dance. The tailor did a great job on their kimonos, I must say. It’s even complete with a delicately woven obi jime. A little note on this Japanese dance performance. Actually, there’s a girl who encountered a bit of trouble during the dance. She accidentally twirl her hair in the umbrella she was holding and her hair got stuck there. I was aghast when I saw that. I half expected that she would burst into tears, but she handled it very well. She was calm and composed as she tried to release her hair, and after a while she managed to do so. I’m indeed amazed with the way she handled the situation. She handled it like a pro. 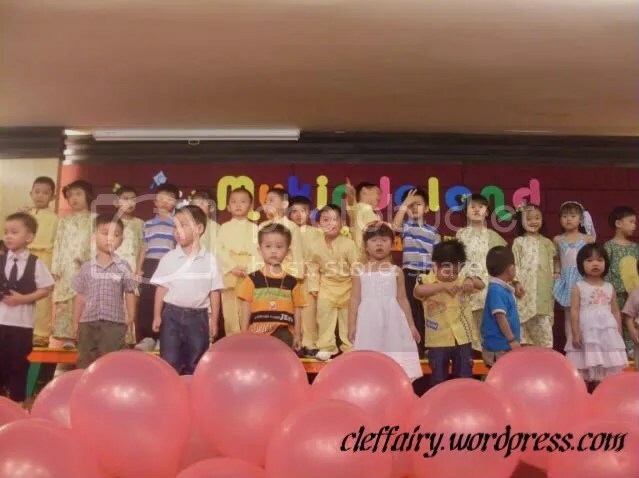 Three years old students reciting nursery rhyme. Very adorable performance, it made my heart melt, no kidding. The children performing a waltz dance to the song Que Sera Sera. They’re such a sweet heart, their performance melts my heart . They did waltz and seriously I doubt I can even attempt a dance like them without stepping on my partner’s feet. Okay, these kids are charmers, I was practically swooning when I saw the children do their Cha Cha dance. 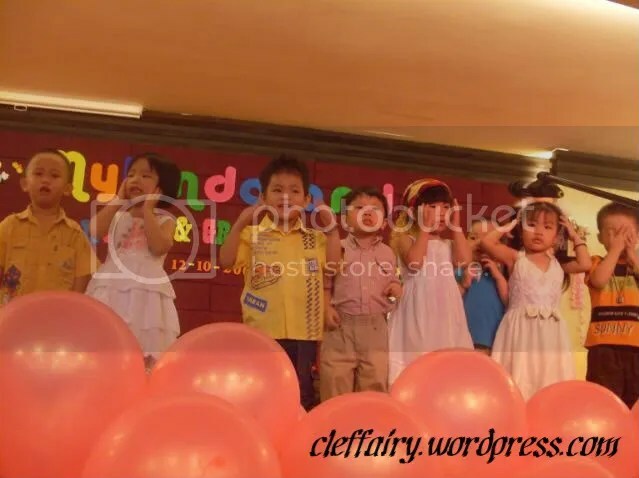 I believe, this kind of event not only teaches the children on how to work together and sharpens their hand-eye-ear coordination, but also encourage friendship among them. 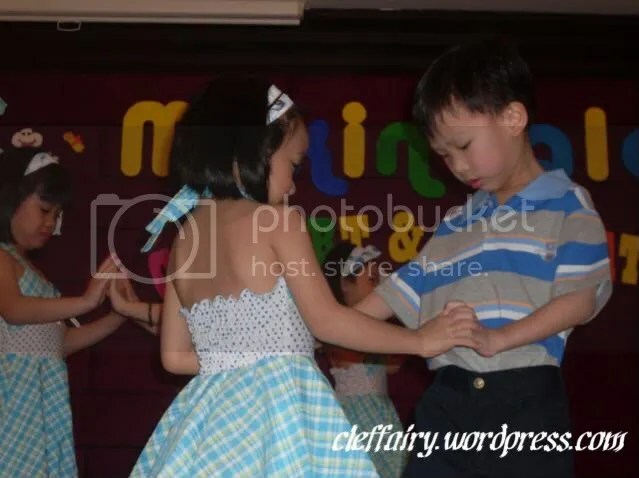 Memories on first dance with their kindergarten friend will probably be imprinted in their mind until they grow up. Sweet memories to reminisce on, I must say. There are a lot of performance by the children that day, and I only put half of it over here. I wanted to put up more pictures of the children’s performance, but my article is getting long, I’m afraid it’ll bore my precious readers. Anyway, it’s sufficient to say that Mykindaland not only spread international culture in their syllabuses, but maintain local identity too, as the children did not only performed Waltz, Japanese Dance, Cha-Cha and Limbo Rock, but they also performed Indian traditional dance(which is a big hit and got me screaming with glee at their choreography) and Malay Dance as well. Last but not least, it’s graduation time for Mykindaland Class of 2008. This one got my eyes misted, and I have no idea why. Your truly is indeed an emotional person. I only manage to get a few pictures of the kids during the ‘appreciation’ ceremony, as I decided to rush out of the scene before I made a scene with my red and watery eyes. Don’t blame me for escaping. I have a reputation to maintain. 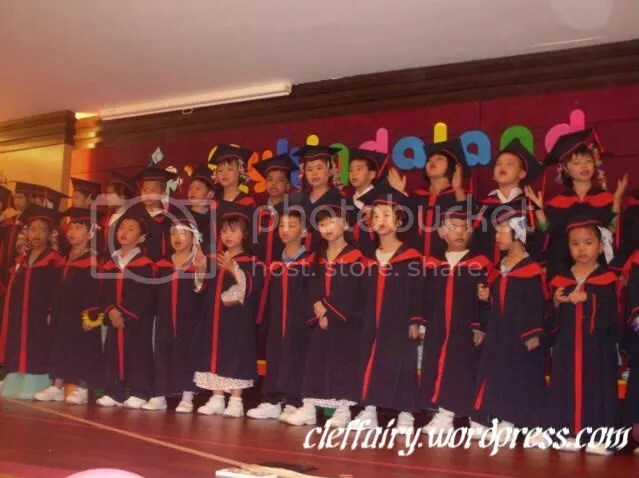 Below are the children’s picture during the graduation ceremony. 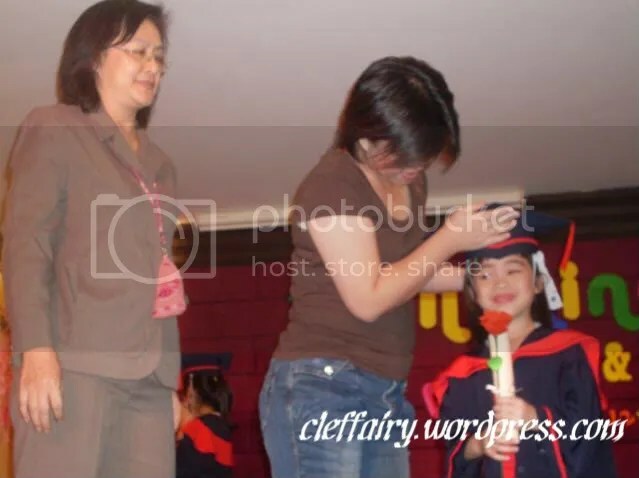 The teacher was preparing to lead her students on stage for the graduation ceremony. The principal, Ms. Elaine Low, looking on during the graduation ceremony. I seriously don’t know how she manage to stay on stage without breaking into a sobby mess out of pride like me. Above is the picture of Mykindaland Class of 2008 graduation picture. Last but not least, the choreographer who was responsible for creating simplified dance movement for the children and the emcee lady . The choreographer is on the left hand side while the emcee lady is the one in blazing red. Cleffairy: I know this is not related to my entry, but a blogger friend of mine, Kevin has lost his dear aunt last Friday. Here I would like to extend my deepest condolence to Kevin and his family. This entry was posted in A Penny For Your Thoughts, Current Issue, Event coverage. Bookmark the permalink. wow… this is my first time to see so many nice pictures on your post entry!! Reminds me abt my daughter’s concert when she was 3 yrs old. At first she cried but then she regained her composured and performed her dance confidently. Cute! anything on children is fantastic!!!! good for you. i vaguely remember when i was a kid, i did a lot of dancing and wearing a bee costume singing “siow mit fong”. hahaha….will publish it soon. i, on the other hand will be attending a small gathering party like for the underpriveleged children this coming saturday. 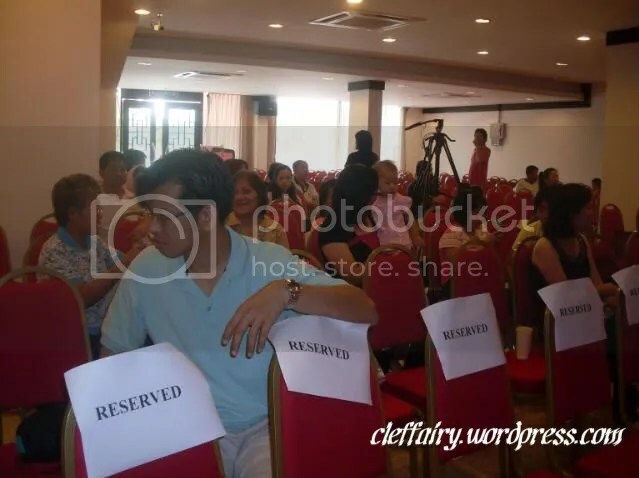 too bad rachel will not be able to attend, but i think she might be taking an mc…hehehe. will post all about it this coming weekend. Pingback: Does any have to do paper work to graduate from college? Yoz, yoz, Lizzy. Those kids are so cute. 😀 You’re right, some parent’s expectation of their children are too high, sometimes, no matter wud they did, their effort is not appreciated. The kids may give 150% of their effort, have little flaws in the result, and the parents goes berserk. Sad to see such thing in the process of growing up! u can be very amaze when u see these parents pushing everyone just to get a nice place to take their children’s picture. Well, those pushing parents are proud and want to take some valuable memories. As for those criticism from parents, they are preparing their childs for the real world. How? By putting them in a situation where they will get scolding when they screw up some asignment in work place! These parents sure start them young..hahaha. Parents starts preparing their children young, yes, granted they wanted nothing but the best for their child. However, one would have to put the chiding mildly and not embarrass the child in public. Such act could do damage to a child’s self confidence. Wow I’m actually the only reply to your amazing read? !